Sustainable development has been a vital part of our company since its creation. We believe that maintaining balance and harmony in every aspect of life ensures peaceful and healthy evolution. 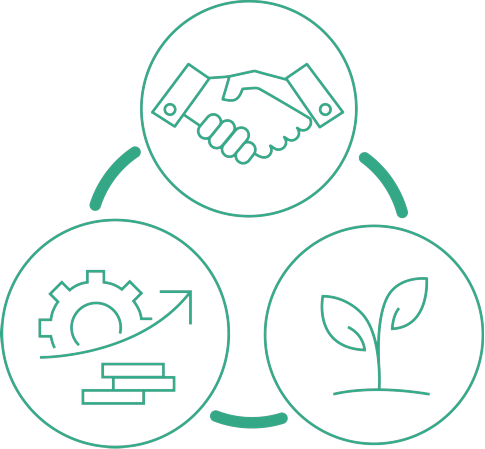 In a company, maintaining the same balance between economic, social and environmental aspects is the foundation of a stable and strong position in the market. Ceaseless work on finding the right balance allows us to meet the needs of the present generation, but at the same time it does not diminish our chances of satisfying future generations that grow up in a spirit of sustainable development. The social aspect is for us, as a company, particularly important due to the fact that people are the foundation of our company. Therefore, we make every effort to ensure that our employees, partners, clients, and indeed all people that we encounter, are treated fairly and with due respect for their human rights. The factories we use are subject to thorough spot checks regarding the employment of minors and their compliance with health and safety regulations. We take the utmost care to adhere to principles of equality and ensure we harbour no cultural, ethnic or religious prejudices. We provide our employees with stable employment, safe working conditions, and, among other things, healthcare packages. Our relationships with our suppliers and business partners are primarily based on partnership, mutual trust, and integrity, while simultaneously ensuring the professionalism and reliability of the services we offer. Economic development is another critically important element that is necessary to maintain the company's evolutionary equilibrium. Regular investment in the right equipment for our production, service and logistics processes, brings tangible results in the form of, among other things, the high quality of the products we offer. Financial resources allocated to staff training enable employees to develop while building on their education or individual predispositions. Qualified staff make for a professional, reliable service that is very important for the proper functioning of the entire company. The environmental aspect completes our sustainable development policy. Our company's care to intensively develop this area is of great importance when it comes to building pro-environmental public awareness. We constantly strive to improve our production, distribution and logistics processes to make them as environmentally friendly as possible, operating on the basis of ISO14001. The machines we manufacture, for example, limit carbon dioxide emissions or the amount of compressed air used. In addition, we make every effort to recycle any unused materials or waste from the production process. When it comes to distribution, we endeavour to ensure that our products are packed in optimal size cardboard boxes that can be reused or recycled. We always transport our goods in the largest available containers which have been completely filled, and we offer our customers 'door to door' delivery of preferably full-pallet shipments. All these activities are aimed at minimising the logistics process and thus limit exhaust emissions. The strategy adopted, described in detail above, has been in operation in our company for over 25 years. Thanks to the harmonious evolution of each of the three elements included in our conception of sustainable development, we have built a thriving company with a strong position in the market. This success is a source of pride, but also a motivation for further work to be able to better meet social, economic and environmental expectations.